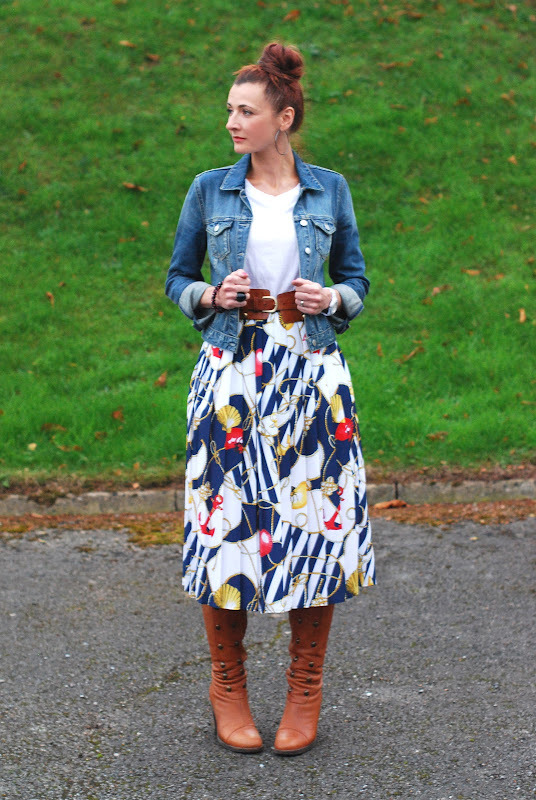 This is the first time I’ve worn this vintage skirt on a cooler autumn day (see how I wore it in the summer here). I quite like it with my fave studded tan boots and denim jacket; on that previous post I received an excellent comment that suggested I wear it with a leather jacket which I think is a great idea. Now weirdly I have never ever in my life bought a proper leather jacket – not through lack of wanting; I have simply never found one that I love enough to warrant spending a lot of money on (which I’ve always maintained you should do to get one that will last years). Now I do have my eye on this one from Asos (what do you think?) which I think is the perfect length, has enough interesting detail to make it a bit edgy and should be good quality considering the price, but I worry that I may find another one down the line that I like more, or that it will go out of style quickly (which is daft as I’ve wanted a leather jacket for about 15 years). Some women are picky about men, I’m picky about leather jackets: can’t find the perfect one, but I live in hope. very very cute outfit! i am loving the whole thing but def loving the skirt!! Ha! I REALLY love this outfit! The skirt is beautiful and love the belt! The title is so cute and clever as well! I really like this look with the jean jacket, but it would look awesome with a leather jacket, too. What color do you want? I have a faux leather jacket that's black, and it seems to go with everything, but brown would be really versatile too.